The deadly Ferguson Fire that torched nearly 97,000 acres near Yosemite National Park was due to a vehicle's catalytic converter coming into contact with dry, roadside vegetation, investigators said Friday. 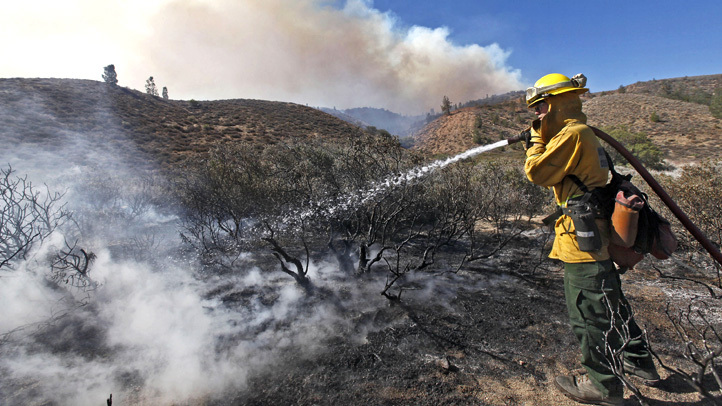 Authorities said the fire started on July 13 along Highway 140 in the Sierra National Forest in Mariposa County. Ripping through bone-dry brush and timber, the blaze wiped out 10 structures and left two firefighters dead, according to fire officials. The flames and smoke also forced officials to close Yosemite valley for nearly three weeks during the peak of the tourism season. At the height of the fire, more than 3,000 people from around the world were working to suppress the flames, fire officials reported. The fire was fully contained on Aug. 22. The vehicle tied to the cause of the fire has yet to be located and officials are asking anyone with information to contact the Sierra National Forest at 559-297-0706.